Heirloom Recipe Series with Lisa Porter. 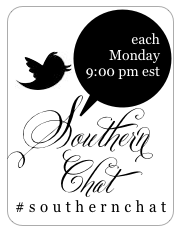 Our wonderfully southern friend Ms. Lisa Porter joins us here this week for the Heirloom Recipes Series and I couldn’t be more happy to have her. Lisa has a delightful blog – The Lisa Porter Collection – that is filled to the brim with inspiration, beautiful things and creativity galore. I love scrolling thru her photos and writings as the bring about happy times. And her profile photo on Twitter will prove to anyone in doubt that she simply is the purest of Kentucky gals, oh how I adore the proper nature of hats! I was delighted that Lisa agreed to join us here this week and know her & her family enjoyed a walk down memory lane while compiling this delicious post for you. She has been truly gracious to IceMilk Aprons over on her blog and I couldn’t be more thrilled to have her here to share with y’all. Enjoy! Just think how remarkable it is that you can mix together flour, butter, sugar, and an egg, and make a memory that will last a lifetime! 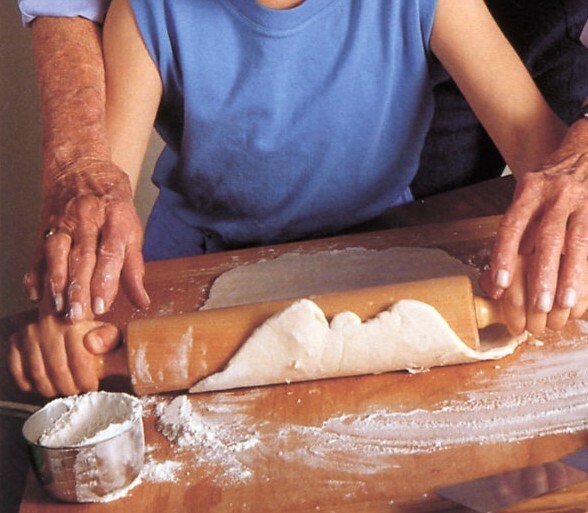 Ever since I was a little girl, I have always had memories of cooking with my mother. Even now, preparing food together is a way for us to connect with each other and with the other wonderful cooks in our family. When I was very young, these values were subconsciously learned and absorbed day after day standing on a chair next to her at the kitchen counter. I was a curious one, carefully watching, and always asking why. I was not just learning how to cook, I was being with my mom and we were playing house! When I was a teen returning home from high school, I would make my way across the courtyard between our house and the garage, through the French doors that led straight to the kitchen. Mom was always home when I arrived. Not in an apron with flour on her face, instead she was usually in her tennis skirt and sun visor and was contemplating whipping up something new from her favorite Junior League Cookbook! Yes our schedules had changed but one thing remained the same, time together in the kitchen, Setting the table and lighting the candles was my job. Still playing house, and no we weren’t formal; we just had an antique chandelier from Mexico that she loved to light for dinner. That was the 70’s and Julia Child and Erma Bombeck had the final word! These days, we still love to gather in the kitchen. It’s the heart the home and the food prepared there nourishes us both physically and emotionally. Food cures and consoles and fills a home with an aroma of warmth and love. Every time life get’s to complicated, I pull my family back to the dinner table, and we all end up happier at the end of the day. In my kitchen, I have a bookcase full of cookbooks. Remember, I used to work for Chuck Williams. But honestly, I love to cook, my husband loves to cook, my daughter loves to cook, and my son, well, he is a growing boy and just loves to eat. We all have our specialties but in the hustle and bustle of everyday life, we seem to have let something far more important slip away, making memories by lovingly preparing and sharing old family recipes handed down through generations. This all goes back to what I mentioned earlier, making memories, making food memories that remind us of a special person, place and time. When I started writing The Lisa Porter Collection two years ago, I knew that cooking and entertaining were topics that I wanted to discuss. When I discovered Ashley and Ice Milk Aprons, I was thrilled to find this adorable, energetic, entrepreneurial young woman who decided that if we were going to be cooking and entertaining in the kitchen we certainly deserved to look fresh, crisp, and stylish! I love how Ashley also believes in keeping all of our food memories alive. She is inspiring whole new generations to find pleasure in preparing food that was lovingly prepared by generations before us. She inspired me to look past my newest cookbooks and unearth what I like to call my golden oldies. Handwritten recipes on stained index cards that remind me that caring hands were at work. These handwritten recipes not only remind me of my southern heritage, they have given me the greatest way to teach my children that a home cooked meal shared with family and friends is truly what makes life rich! I was thrilled when Ashley invited me to share two of my favorite homemade recipes here at Preserves! Four generations of my family have been making these traditional southern desserts. I hope you will enjoy them too! The first recipe is for Apricot Cake. 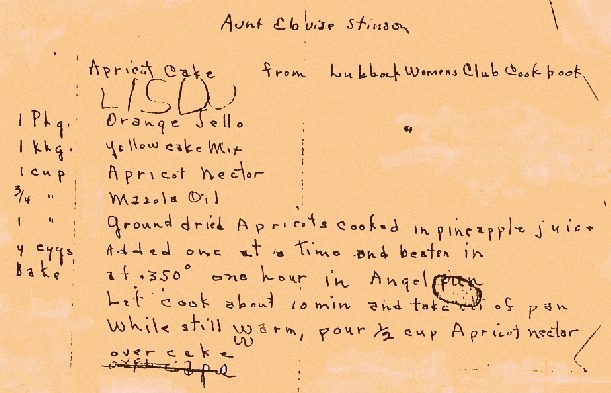 This recipe was handwritten by my mother, and me, for her Aunt Elouise Stinson.This was Aunt Elouise’s favorite Apricot Cake from the Lubbock Women’s Club Cookbook in Lubbock, Texas. She had it every year on her birthday. She made me my first Apricot Cake for my 2nd birthday. Growing up, it became my favorite too! I was always very curious about Aunt Elouise. I remember sitting at her art deco dressing table and running my fingers across her hand cut crystal perfume bottles and monogrammed ivory brushes. She loved red lipstick, good jewelry, Tennessee Walkers, fur coats, and apricot cake! I loved her dearly. 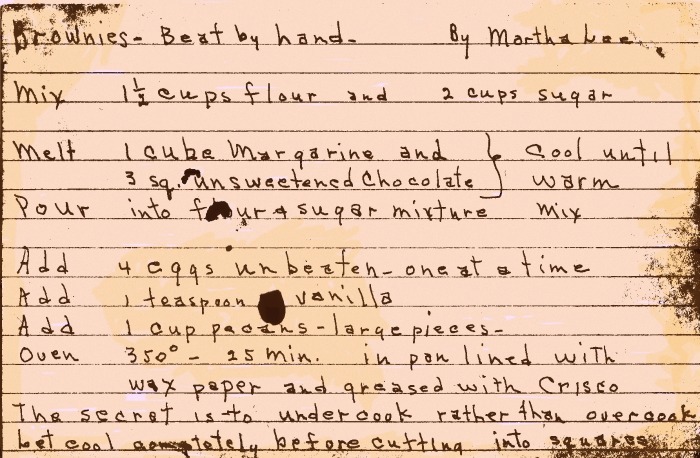 This next recipe is for Brownies-beat by hand and was handwritten especially for me by my Aunt Martha Lee McCaleb shortly before I left for college. 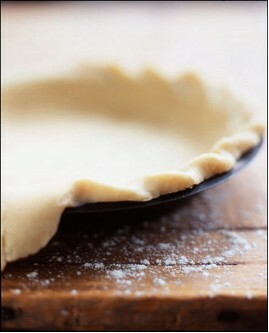 She always said that using fresh ingredients and a little elbow grease was what made homemade the best! How did she ever find the time? Aunt Martha Lee raised a set of twin boys plus one more making for three rambunctious sons. 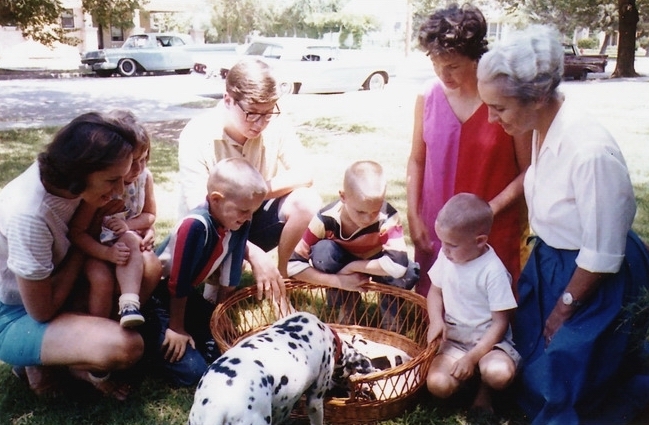 Here we all are in 1962, admiring a new litter of puppies in Granny’s front yard. Aunt Martha Lee in her stylish red & pink shift, Granny, Uncle Charles, the boys, and me on my mother’s knee. Aunt Martha Lee was always so busy in the kitchen. She was usually whipping up creamed tuna on toast and chicken pot pies. All for those hungry boys! I always waited till the coast was clear, then I would grab a kitchen chair and push it right up next to her at the counter. 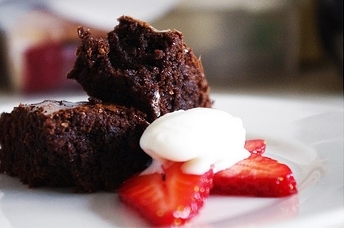 It was time to make brownies. Little did I know we were making memories. Thank you Aunt Martha Lee. I love you. Thank you again Ashley for inviting me to Preserves and including me in your Heirloom Recipes Series! I so appreciate you allowing me to share my two favorite deserts and go on about the amazing women for whom they are named. They taught me long ago that made from scratch means made with love and that the effort that goes into a homemade desert is always rewarded by the pleasure it brings. Please do connect with Lisa over on her lovely blog, The Lisa Porter Collection or on Twitter @LisaPorterColle! I am honored to be your first comment. Lisa is a woman of strength and one gets from reading her blog that she is proud of her southern roots and she shares as a gracious southern lady! 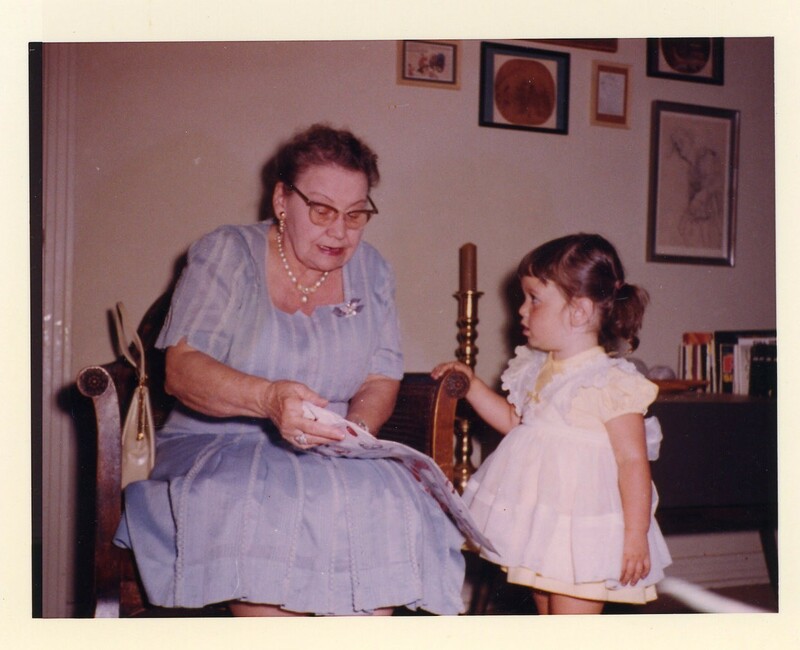 I have some handwritten recipes from my grandmother, and while I don’t have memories of actually cooking with her, I do have great memories of some of her favorite recipes and things she loved to cook. 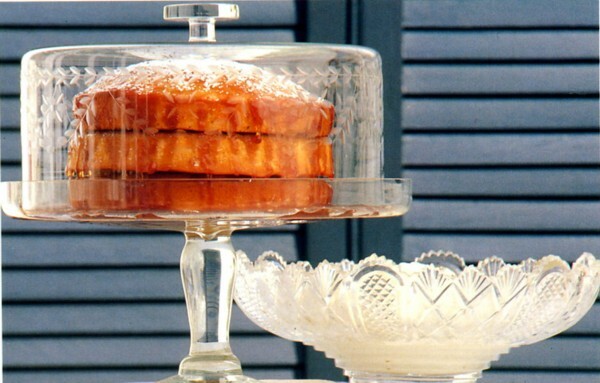 That apricot cakes looks so yummy, I may have to try it myself! Reading Lisa’s words was like reliving my life. Our family too was always about the experiences of cooking and sharing recipes. I’m so glad that Lisa included hand-written family recipes that meant so much to her. Sad to think that the day might come that we no longer hand write such recipes. I recently was looking through old recipes and those written by my mom and grandmothers mean so much, especially now that they are gone. You’ve given me inspiration to not type them but use my own penmanship and make sure all 4 of my children have a copy of their own. Wonderful post Lisa and great photos. I loved this post! Thank you Ashley your blog is tremendous. « Heirloom Recipe Series with Katherine Strate.